Genesis 12–36 contains a cycle of stories about the first three generations of Israel’s ancestors. They record not just the beginnings of a single family but the beginnings of whole nations, particularly Israel. For more than two thousand years, Jews, Christians, and Muslims all over the world have looked to the example of Abraham and his descendants. 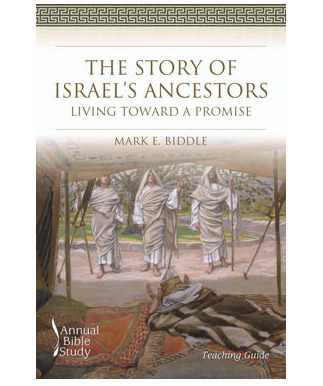 This year’s winter Bible Study of Genesis 12-36 will be guided by The Story of Israel’s Ancestors: Living toward a Promise by Mark Biddle. This five-week study will begin on January 22 and 23. The Tuesday evening group will meet at 7:00 p.m. each week. The Wednesday morning group will meet at 10:00 a.m. Study guides are $7 each and will be available in the church office soon. Please sign up by contacting the church office or completing the event registration form on the church website. Facilitated by Elizabeth Edwards, our Associate Minister, adult small groups meet from September through May on Tuesday evenings and Wednesday mornings. They follow a discussion format where participants are encouraged to offer their own views and share their faith stories. Participants may register for a study series which lasts four to six weeks and include Bible studies, writings of the great Christian classics and current, topical book studies. The groups average 15-20 participants on Tuesday evenings and 6-8 members on Wednesday mornings. Our Bible studies, which typically alternate between Old and New Testament studies, follow the Smyth & Helwys Annual Bible Study Curriculum.